Stem-winder: A person who’s liable to give a rousing speech or effective recap of a situation; also someone or a situation that’s first-rate, of high quality … like the stem-winding watches created in France by Adrien Phillippe (precursor to Patek Phillippe) that became the height of fashion in America after the U.S. Civil War. Think Oprah and the late Steve Jobs. St. Patrick’s Day is rolling around again. It’s that time when we Heinz 57 Americans celebrate being Irish, whatever our ethnic heritage. The Old Bride got a head start last weekend by pouring a wee dram of Irish whisky and a pint of stout to consume with Aunt Ruthie’s annual corned-beef-and-cabbage dinner. It was a food-and-drink marriage made in culinary heaven. 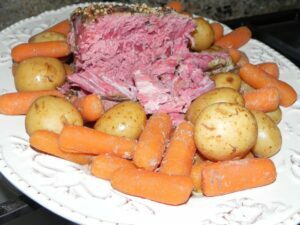 Over the centuries, corned beef has become symbolic of traditional Irish cooking. But nowadays the dish is as American as it is Irish. And it’s also a long-time favorite in Jewish cuisine and in other cultures as distant as the Caribbean, the South Pacific, and the Philippines. The process of corning meat is an ancient method of salt curing. Preserved or “cured” by a salt-brining pickling process, corned beef was rare and coveted because salt was expensive, and cattle were eaten only when their milk-producing and work-animal capability had ended. Corned beef first appears in Irish written documents in a 12th century poem. The product became the leading export from Ireland as early as the 17th century. With prime beef provided from Irish pasturelands, Anglo-Irish landlords created an industry of corning beef to provision the naval fleet throughout the British Empire. The export of corned beef continued through the 19th century. Coastal cities such as Dublin, Belfast and Cork developed into a hub of Ireland’s beef curing and packing industry. By 1668, Cork corned beef amounted to half of Ireland’s annual beef export. But the Irish people did not consume much of the beef produced in their own country. Most of their corned beef was being exported to the British Navy, and also to the British and French colonies as cheap food for slaves on American and Caribbean plantations. As a result, while virtually unattainable by the impoverished Irish nationals in their homeland, the product became disdained in the colonies for its association with poverty and slavery. The corned beef industry helped contribute to the Irish potato famine because of over-grazing of premium pastureland for the British elite. The Irish locals were left to farm crops that would grow in poor soil on the leftover land … the potato fit the bill. Even today, corned beef is not an everyday food in Northern Ireland and areas distant from the centers of Irish corned beef production such as Cork. It is, however, a popular food for tourists visiting Ireland. Ironically, the Irish who came to America, like the slaves and other poor immigrants, embraced corned beef as a cheap, filling food, and as a substitute for bacon in their traditional dish of bacon and cabbage. 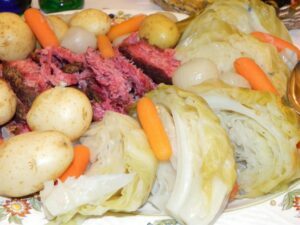 Our New England boiled dinner of corned beef, cabbage, and root vegetables such as potatoes and carrots, descends from this tradition. The cut of beef most commonly used for corning is the brisket, which consists of a pair of thick muscles from the steer’s chest. A whole brisket is large – weighing about 18 pounds – and it usually is cut near the middle to be sold as flat or point sides. Because brisket is made of muscle, it is a tough cut of meat, requiring slow cooking. The beef may be corned in one of three ways: (1) injection; (2) sprinkling with the mixture; and (3) soaking in a 4-to-6% brine solution in water. Use the wet brining method to achieve even penetration of the salts into the meat, if corning your own meat. The corning brine consists of sodium chloride and pink curing salt such as Pink Curing Salt #1, also known as Prague powder #1 or Insta Cure #1, made up of 94% sodium chloride and 6% sodium nitrite with anti-caking agents and red dye. NOTE: Pink curing salt is not the same as exotic Himalayan pink salt. The curing salt kills bacteria such as botulism. Once corned, the meat can be cooked for consumption as corned beef or —with two extra steps of smoking and steaming — as pastrami. Either way, yum yum. This week we are looking at the traditional boiled version of corned beef and cabbage and a slow cooker version. There’s yet a third variation: Baking the corned beef sealed in foil, but we’ll cover that some other time. The small packet of pickling spice that comes packaged with corned beef from the grocery store is inadequate to cook a 4-to-5-pound brisket. Either toss the packet, or combine it with the following. Combine all ingredients. Add to the boil water before cooking the brisket. This rub is optional, but it enhances the flavor of the brisket. Combine the seasonings. Remove corned beef from the vacuum package. Rinse the beef under cold water, and pat dry. Rub the seasoning mix on all sides. My Aunt Ruth in Memphis made the mistake several years ago of inviting family to dinner for corned beef and cabbage. My Memphis brother and I have imposed on her annually ever since. Rinse the corned beef after removing it from the vacuum package. Place it good side up (fat down) in a large Dutch oven or a 7 or 8-qt size stockpot. Cover completely with cold water and add both the pickling spice packet and entire amount of homemade pickling spice. Place onions, carrots and potatoes around the beef, making sure all are completely covered with the water. Bring to a boil and skim off the foam. Continue simmering on medium for about 2-1/2 hours until the beef is fork tender. Remove the beef to a platter, leaving veggies in the pot. While the beef is boiling, tie kitchen twine around each cabbage wedge to keep the layers from separating. Also combine the brown sugar, sherry and mustard to form a paste. After removing the beef from the boiling water, coat it with the mustard paste and place in oven set to 300-325˚F on medium rack. Bake for about 15-20 minutes to create a “bark” on the beef. Remove to a platter to set up before cutting against the grain into slices. While beef is baking, bring pot water back to a boil and carefully drop in the cabbage wedges. Boil the cabbage for about 10 minutes until tender but not sludgy. Plate the beef with the cabbage wedges, boiled onions, carrots and potatoes. Serve with horseradish sauce, dill pickles, mixed greens salad, and Irish soda bread. This is a fix-it-and-forget-it version. Start it before work or school in the morning and eat it for dinner. Remove beef from vacuum package, rinse under cold water, and pat dry. Coat all sides of the beef with dry rub. Position the sliced onion and carrots evenly across bottom of slow cooker. Position the beef on top of the carrots; surround with the potatoes, and pour the optional Guinness around the beef. Top off with cold water to just cover the beef. Add pickling spices (the packet and entire homemade batch). Set cooker to cook for 8 hours. Remove the beef to rest before slicing. Add the cabbage to the slow cooker liquid and cook for another 30 minutes;, OR after removing the beef, also spoon the carrots, onions and potatoes into a stockpot. Strain the slow cooker liquid into stockpot (to remove the foam) and bring back to a boil. Add the cabbage and boil for about 15 minutes until tender. Plate the beef with the veggies; serve with crusty bread and horseradish sauce. Laurie Triplette is a writer, historian, and accredited appraiser of fine arts, dedicated to preserving Southern culture and foodways. Author of the award-winning community family cookbook GIMME SOME SUGAR, DARLIN’, and editor of ZEBRA TALES (Tailgating Recipes from the Ladies of the NFLRA), Triplette is a member of the Association of Food Journalists (AFJ),Southern Foodways Alliance (SFA) and the Southern Food and Beverage Museum (SOFAB). Check out the GIMME SOME SUGAR, DARLIN’ web site: www.tripleheartpress.com and follow Laurie’s food adventures on Facebook and Twitter (@LaurieTriplette).